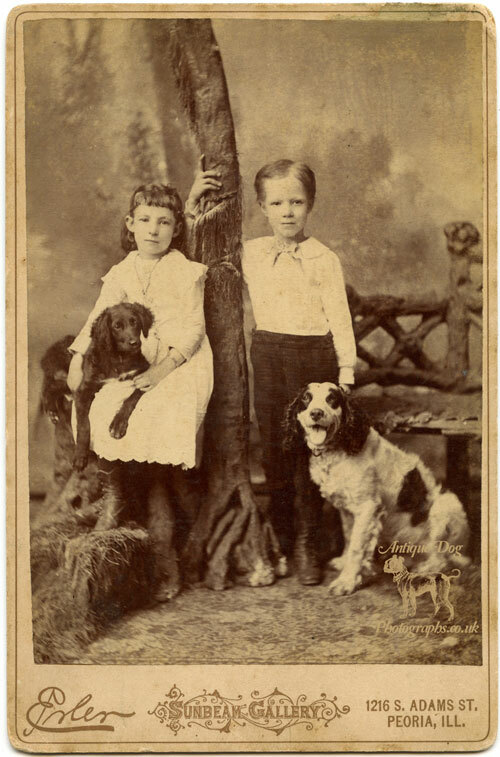 In this photograph we have two siblings, so similar in appearance and age I have considered that they might be twins. With them they have the family dogs, a Springer type spaniel and a Cocker spaniel type puppy. The studio props are somewhat usual as a fake tree and naturalistic wooden benches are used to give an outdoor appearance, whilst the props and subjects stand on a patterned carpet. The larger older dog has done a good job posing and looking straight at the camera. Where as the young pup seems to be concentrating on something off to the right hand side. 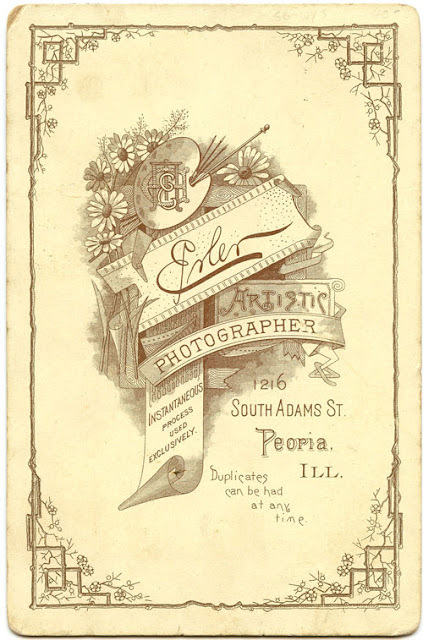 The photographer is Max Erler, he operated his "Sunbeam Gallery" at 1216 S. Adams Street in Peoria, Illinois between 1883 and 1898. 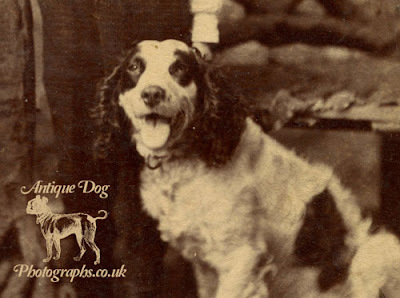 The style of the photograph's mount with its elaborate lettering and fancy imprint on the reverse would date this image to the latter part of this time period. Max's father Michael Erler was born in the city of Reichstadt, Germany, June 23, 1829. From the age of 14 to 19 Michael he was apprenticed to learn the trade of a watchmaker, a skill which he put to good use when he arrived in Amercia on 1st of August, 1848. After two years Michael was able to set up his own business as a watchmaker which proved very successful. Michael was described thus "he is a man of earnest, strong character and intelligent mind, and his honesty and unswerving integrity in all the transactions of life have gained him a high place in the regard of all who know or associate with him." Michael married in June, 1850, to Laura Lehne, whose parents were early pioneers in America, and were also natives of Germany. Michael and Laura had seven children together including Max who was born on 16th of February 1856. 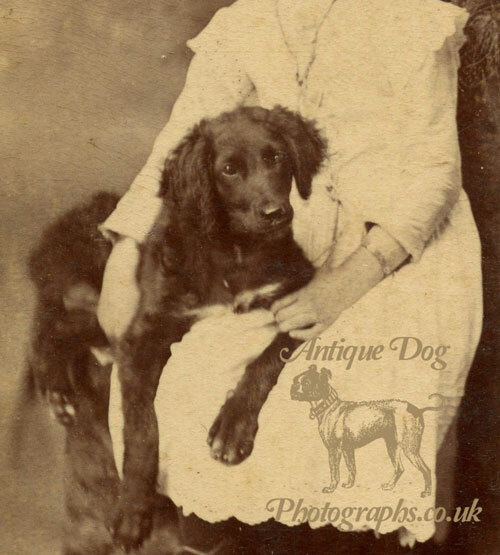 Max married Jennie E. Harris on 28th of June 1883. 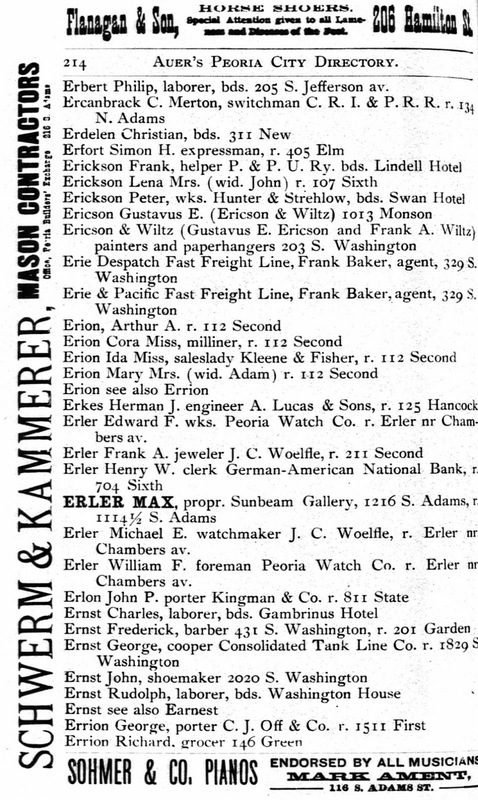 He remained is listed as a photographer in US census records and city directories up until 1920, during this time he became one of Peoria's finest portrait photographers and was well known as a wedding photographer. Max Erler in the Peoria, Illinois, City Directory, 1890. Wow, if they weren't twins, they were definitely stairstep babies. This is such a cute photo. It's hard to go wrong with dogs and kids, right?